Put on that Ugly Sweater! And Banish Cold and Flu! When we were children we had a mother, grandmother, or friend’s mom who badgered us about going outside without our coat, leaving home with wet hair, and playing in the rain. It may surprise you to learn that we agree with your grandma… stay covered! According to the view of Traditional Chinese Medicine (TCM), colds and flus are caused by external pathogens. Conversely, Western medicine corresponds cold and flu with airborne micro-pathogens, such as bacteria and viruses. Although Western medical sciences do not list wind, rain, or cold as direct causes of illness, traditional medicines from China, Korea, Japan, and Tibet recognize a correlation between environmental conditions and illness. According to Chinese medical theory, the three main external pathogen categories that affect the body during Winter are: WIND, COLD, and DAMP. Often in Southern states we see HEAT as a factor as well, even in the Winter. It is easier to stay well, than to get well! So pay attention to some little known causes of Winter illness. Watery discharge — nasal, ocular (eyes). 3. DAMP. While Cold and Wind are two forces of nature that most of us can conceptualize at least a bit, dampness is more difficult to understand. A thorough explanation can be found in TCM literature. Dampness is most closely associated with the symptom of phlegm; although, Dampness may reside anywhere in the body and may not be as obvious as phlegm that is coughed up. *Keep External Parts of your body covered when in cold environments. *Protect the Back and neck. This area is immensely important to keep out wind. Consider a scarf when outdoors. *Protect the Feet. Never go barefoot on cold floors, it is said to stress the kidneys (kidney channel and organ system). Wear slippers around the house. *Protect the Joints. Those with cold related knee pain should wear support sleeves over the knees. *Protect the Abdomen. Use a belly warmer. This is a thermal sleeve for the abdominal area used to prevent cold related menstrual pain or low back pain. *Acclimatize. Avoid sudden climate changes such as going from a hot shower to a cold bedroom. If your pores are open from a hot shower and you immediately expose your skin to cold air you can suffer a cold or wind invasion! Consider a gentle and mellow rinse of comfortably cool water at the end of a shower to close the pores, and tighten & tone the skin (good for skin & hair as well!). *Stay Dry. Wet or damp hair can put a hit on the superficial immune functions, which are the first lines of defense from the pathogens that can make one sick. Keep your hair & body dry and covered. *Keep your Defensive Qi healthy. Consume warming food and drink. Eat spices such as ginger, garlic, cinnamon, fennel, and clove. Avoid cold or raw food and drink during the cold season. Consult with your OMD for dietary advice that is specific to your constitution. If you start to feel sick, go see your oriental medical doctor for treatment as soon as possible — time is of the essence! Acupuncture, moxabustion, and cupping can be used to boost immune function and drive out pathogens when they invade. Certain herbal formulations can also increase the function of your immune system or expedite the process of healing. 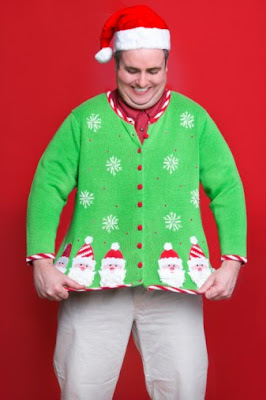 Put on that ugly sweater and stay healthy!